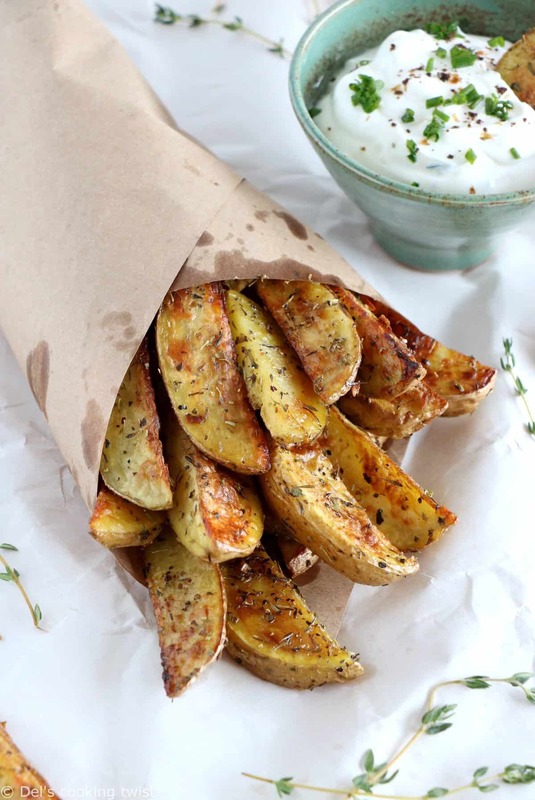 Easy oven baked potato wedges, crispy on the outside and perfectly seasoned with herbs and garlic. They turn out fine every single time! 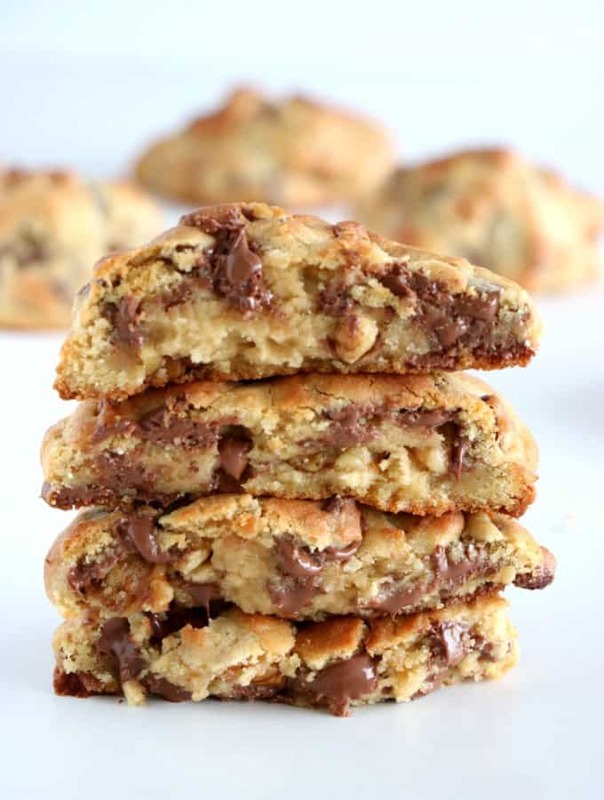 You asked for more easy recipes? 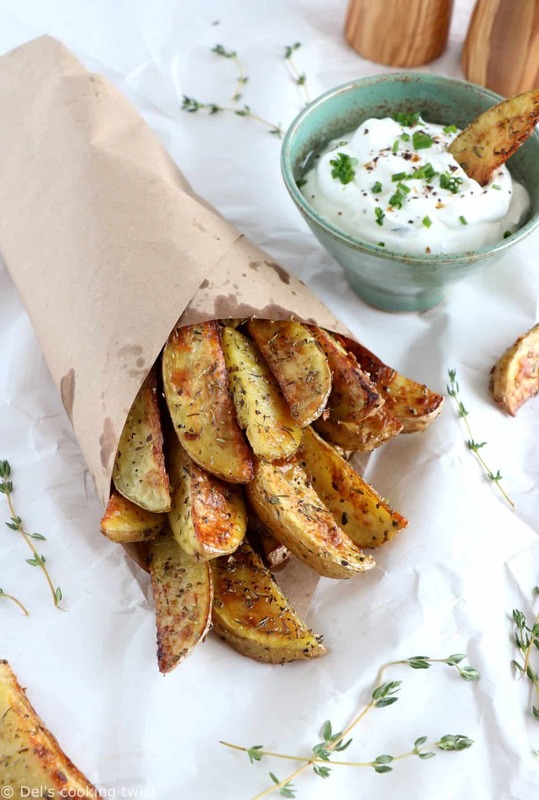 There you go today, with my favorite potato wedges recipe. Nothing crazy or advanced, just simple ingredients tossed together to get a perfect taste and texture every single time. 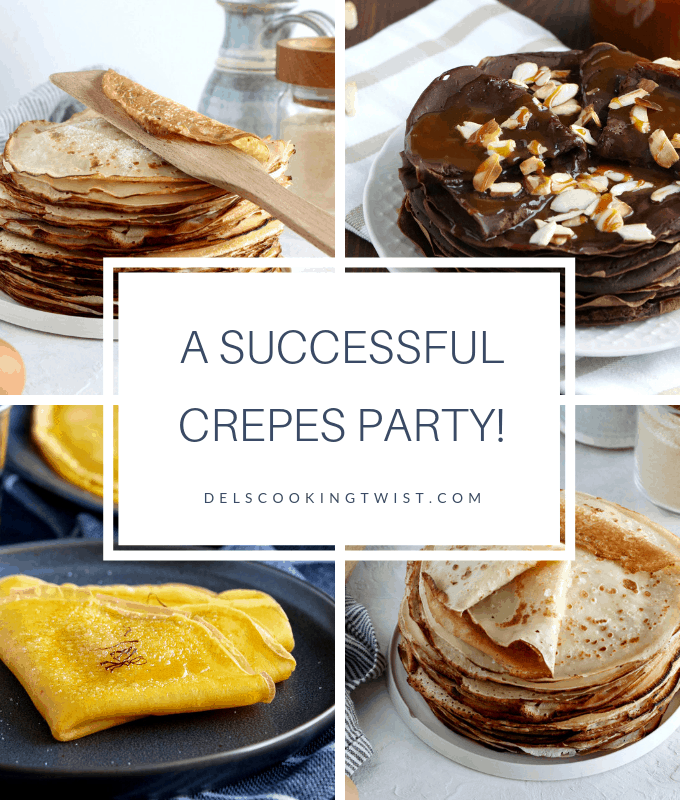 You might know the recipe already and make it every so often, but if you’re not be prepared as you will come back to this recipe more than once! Before we go further, let me ask you a question. Or two actually. 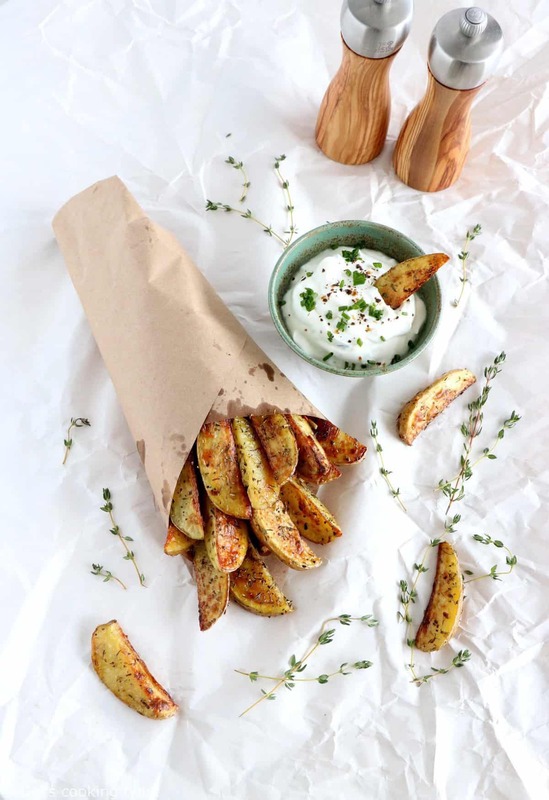 My first one is the following: how many of you love homemade potato wedges? (I can see many hands rising already). My second question, if you said “me!” to the first one: how often do you actually prepare some at home? (I see fewer hands rising up). The truth is: while we all love fries and all kind of potato wedges, we usually order them at the restaurant rather than preparing them at home. They became our junk food for lazy days and definitely not on the menu at home. I would like to change that, or at least be part of this change. We usually consider one food good or bad, and in bad I mean “unhealthy”. Our believes are mostly based on our experience dining out in very bad places where it smells frying oils and all kind of fats. Of course, fries are number one of this list; they are the most unnecessary food that exists, all things considered. But what if you learned how to make them right by cooking them at home? Let me be more specific here. When I was a kid, I happened to take part in potato harvest at my family home a few times. I found it super funny and I loved digging out the potatoes from the soil, it was like finding a hidden treasure. 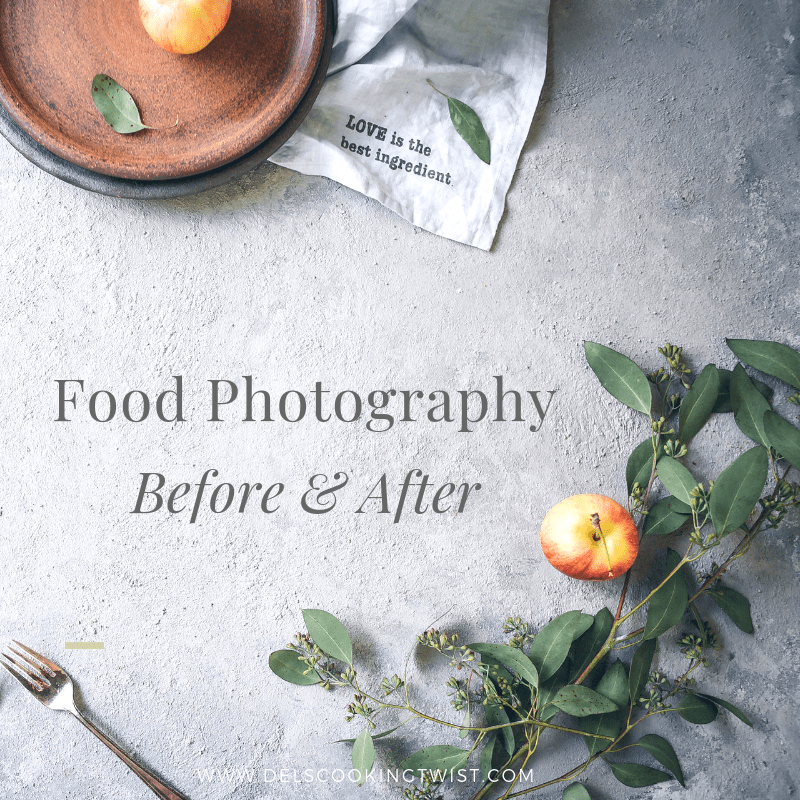 We would then cook and eat them in their most simple way, savoring both the result of our work and the taste of these newly harvested potatoes and I remember my grandmother saying that there was nothing like new potatoes. But why am I telling you all this? 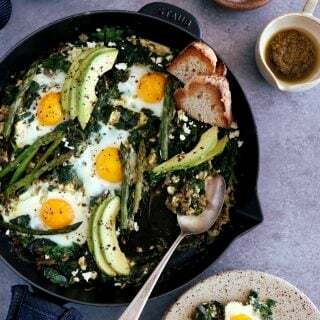 All I want here is to point out that when we take time to really consider what’s in our plate, we realize that simple things taste good, as long as there is love either in harvesting or home cooking, or both for the lucky ones. Potatoes are definitely not on the forbidden list, you just need to choose your battles and mine consists on eating only great potatoes, cooked with love and most importantly with other ingredients of high quality (forget palm oil!). 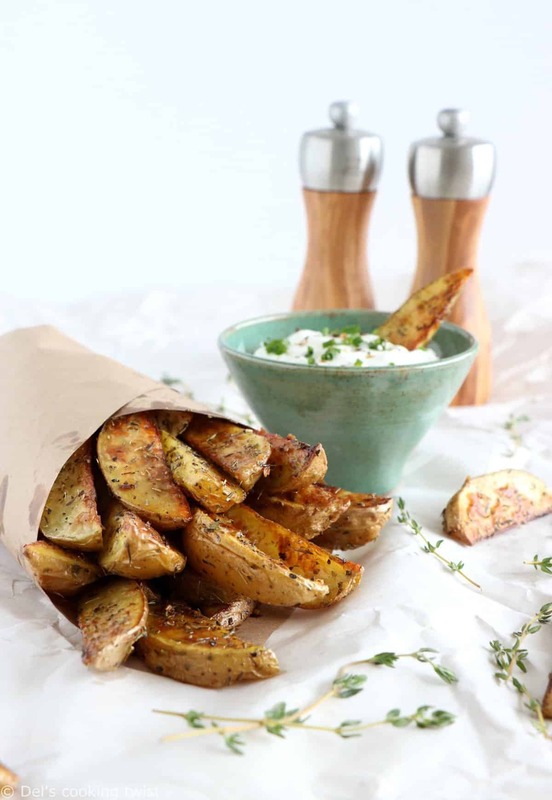 These potato wedges are coated with olive oil, which is the first great add on to the recipe due to the health benefits of this oil, not only on the cardiovascular health but also for the contribution to the maintenance of normal blood LDL-cholesterol levels. Then, the potatoes are simply seasoned with garlic and dried herbs. I prefer freshly grated garlic over garlic powder but occasionally I can consider the second option by lack of time. When it comes to herbs, you will notice I went for the so-called herbes de Provence (my French background is never too far). You could replace them with an Italian seasoning or any other herbs you have at hands such as rosemary or thyme for instance. 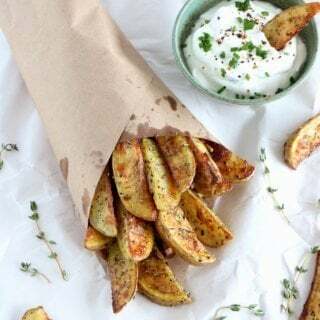 Once you coated your potato wedges with the other ingredients, display them on baking sheet previously lined with baking paper and bake in the oven until golden and crispy. It’s that easy; really there is nothing else to do. 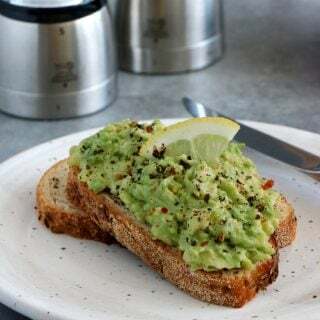 Everyone can make them at home and believe me the taste will be considerably better than the ones you are used to in a restaurant. 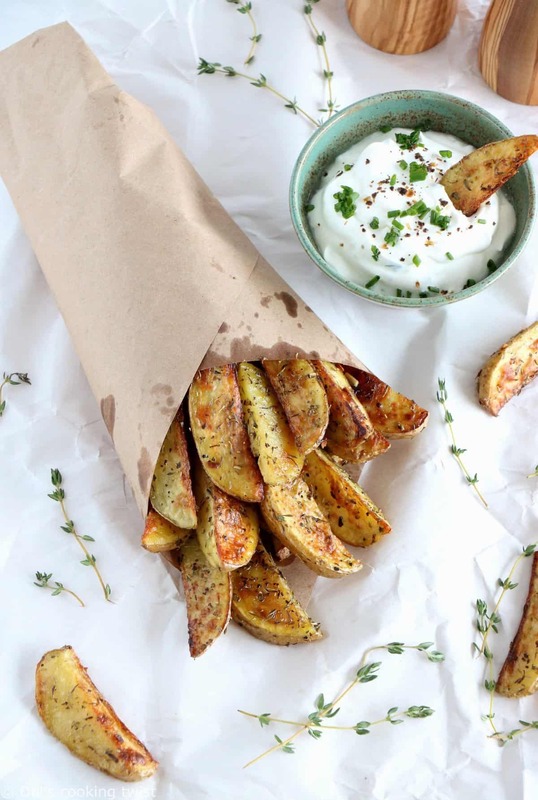 These potato wedges are naturally flavored and it makes all the difference. 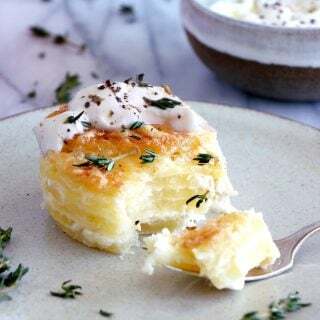 You can then serve them with any poultry or meat dish of your choice, or just by themselves as a snack, served with a white dip on the side (here I simply combined sour cream, fresh chives, fresh lemon juice, salt and pepper). 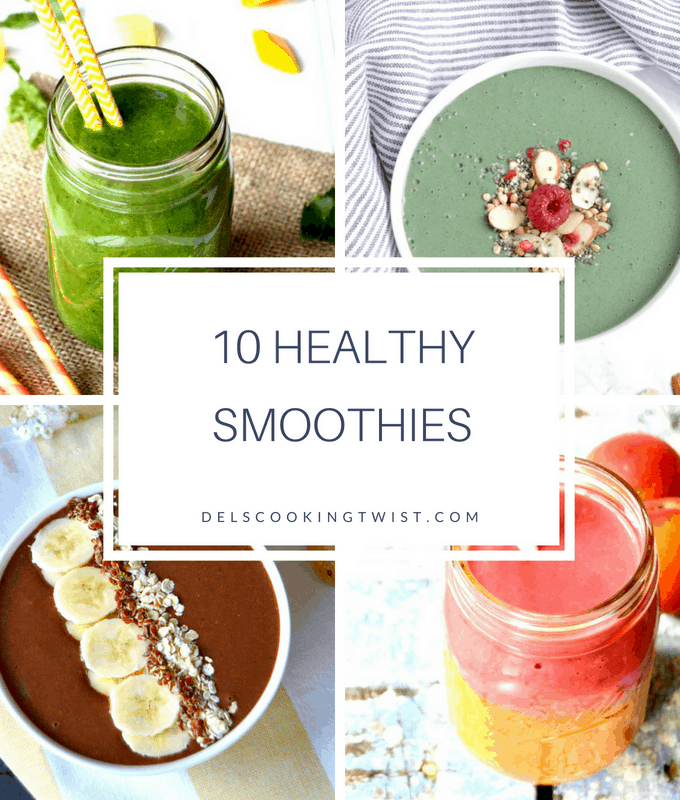 And if you want an alternative to these beauties, you can sometimes go to my healthy sweet potato fries with an avocado dip, that are one of my readers’ favorite recipe on the blog. 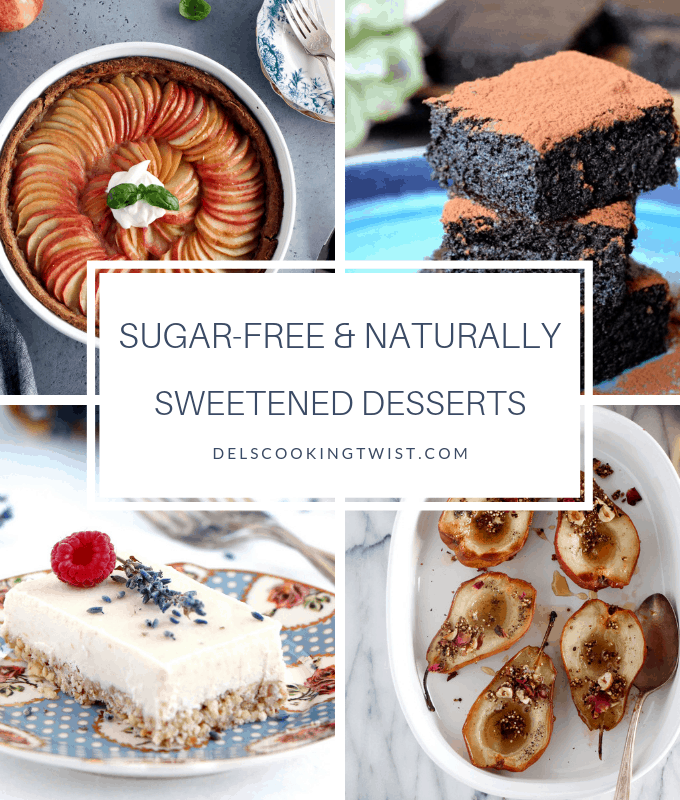 Grab the recipe now and enjoy! 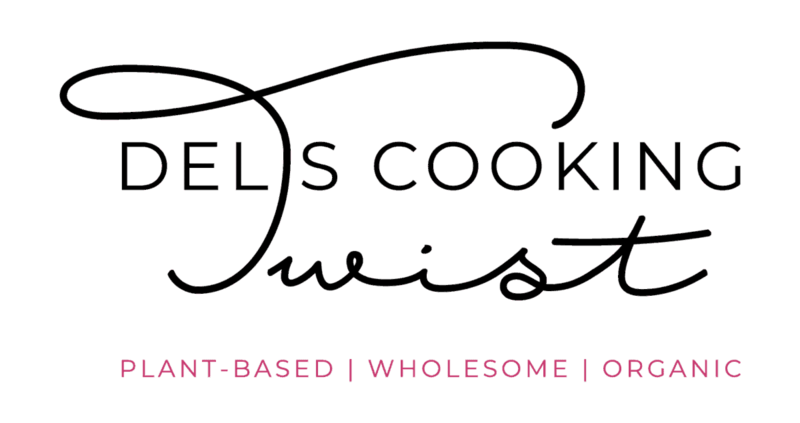 Preheat the oven to 450°F (230°C), and line a large baking sheet with parchment paper. Set aside. 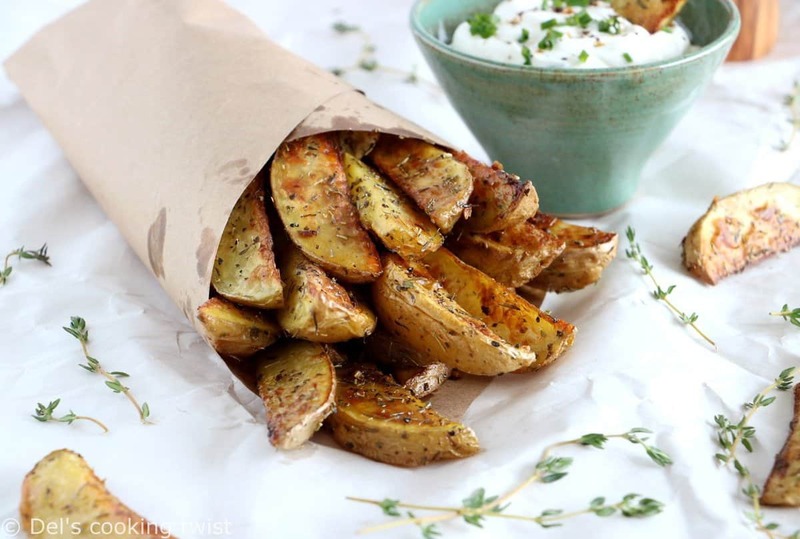 Slice the potatoes in half (lengthwise), then cut each piece into wedges. Place the potato wedges into a large bowl. Pour in the olive oil and add garlic, herbes de provence, salt and black pepper. Mix well, making sure each wedge is coated with oil and spices. 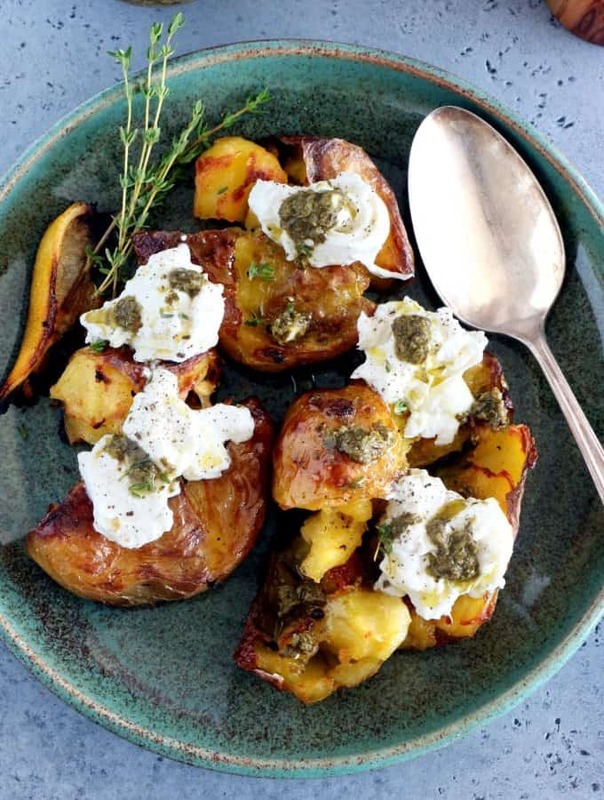 Arrange the potato wedges in a single layer on the prepared baking sheet and bake for 30 minutes, stirring once or twice. Then turn on the broiler and bake for another 4-5 minutes, or until they’re well browned and crispy. Cool wedges on pan for 5 minutes and serve immediately. Merci pour cette recette de frites au four avec la sauce. Le tout a l’air délicieux! Les photos sont également très jolies. Je vais essayer ta recette ce midi avec les herbes de provence 🙂 Merci et belle journée!! J’ai fait des frites maison récemment et je les ai fait trop cuire… Persuadée en les voyant qu’elles n’étaient toujours pas cuites… Hum. Je me suis aussi dit que les pommes de terre n’étaient pas les bonnes. 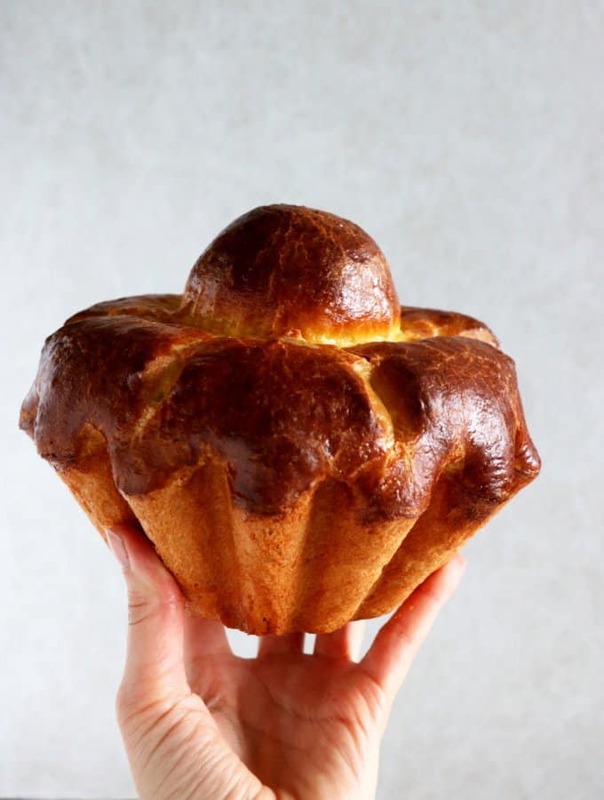 Pouvez-vous nous dire ce que vous prenez comme variété ? saupoudrées d’un peu de paprika doux, elles prennent une jolie couleur et le goût n’en est pas modifié. Je les fais ainsi depuis de nombreuses années et tout le monde se régale …. Hmmm… ca m’a l’air très appétissant tout ca, je testerai la prochaine fois. Merci Monique pour l’idée! Elles sont magnifiques tes frites/potatoes ! Du temps regretté où j’avais un four, j’avais essayé de faire des frites de pommes de terre et carottes suivant une recette que l’on m’avait donnée. Les frites de carotte comme de pomme de terre que j’avais faites étaient très bonnes (je recommande donc pour les frites de carotte), simplement c’était plus des cubes que des frites dans la forme aha la recette que j’avais était la même en plus longue car il y avait une étape en plus après avoir coupé les légumes en morceaux, la recette disait de rincer les morceaux et bien les essuyer (ce qui était chronophage) afin de rincer/enlever l’amidon.. Ce n’est donc pas nécessaire ? Le reste de la recette était semblable sinon et je me souviens que c’était très simple, juste l’étape de rinçage qui était un peu pénible donc si elle est superflue, c’est une super nouvelle ! Je cherchais comment accompagner nos burgers végétariens (un gros champignon gratiné au fromage en guise de steack) avec de bonnes frites maison, je crois que j’ai trouvé mon bonheur avec votre recette ! Est ce que je peux vous demander d’où viennent vos jolis moulins a sel et poivre en bois?